We tend to think of the 20th century as the time when Western artists dramatically broke with traditional painting and sculpture that had been revered for centuries. No longer content to turn three-dimensional reality into two-dimensional mimesis on canvas or to create static figures in marble, they sought new ways to express not only what they saw around them but also what they felt. Everything about the avant-garde artistic movements seemed radical and innovative, particularly for the people to whom it was first introduced. It was indeed revolutionary then, and initially condemned by some. However, this phenomenon was true primarily for European-based societies. Aspects of the so-called "new" art were actually ancient in diverse non-Western groups. I think of the geometric shapes that continue to appear in the weavings of Laos, Timor (Indonesia), the Andes, and Native America as well as in ceramics and basketry. Navajo blanket (ca. 1870). De Young Museum, San Francisco. Mimbres bowl (ca. 1010-1130). De Young Museum, San Francisco. I think of exaggerated faces and bodies that are still carved by African and New Guinea tribes. But in the 20th century, modern art looked, well, amazingly modern and even extreme to Westerners who were accustomed to what they considered acceptable--classical art, art of the academy. "Embodiments: Masterworks of African Figurative Sculpture," 2015 exhibit at the de Young Museum, San Francisco. In the 21st century, from time to time, I chance upon a variety of unexpected precursors that make me realize, once more, that "there is nothing new under the sun" (Ecclesiastes 1:9). What is new is how an artist works with what is actually old, perhaps even prehistoric. It's unlikely that the artists who congregated in Paris during the late 1800s and very early 1900s were familiar with cave art. Almost 100 years ago, archaeologists were busy digging at Abri Blanchard and Abri Cellier, two sites in Dordogne, France. The paintings at Lascaux were not discovered until 1940. Then a team returned to the sites in Dordogne in 2012 and 2014 and found limestone blocks onto which people from 38,000 years ago had used a labor-intensive "pointillist" technique to create a woolly mammoth. They chiseled rows of dots into the stone. "Pointillist" painting at Chauvet cave. On the walls of the Chauvet caves nearly 250 miles away, the image of an animal reveals a different method: by applying paint to the palm of the hand and then pressing circular smudges into the wall again and again, they made the figure emerge. "Le Bec du Hoc à Grandcamp" (1885), by Georges Seurat. Tate Gallery, London. As far as I know, French artist Georges Seurat (1859-1891) did not chisel into stone or make circular smudges with his palms. However, in the 1880s, along with another French painter, Paul Signac (1863-1935), he developed Pointillism, a brushwork method in which tiny, separate dots of color are applied in patterns to form an image. Rather than blend pigments on a palette, the artist relied on the eye and mind of the viewer to merge the distinct spots into a full range of tones. Clearly, there's a difference between what the French painters and the prehistoric people created. Still, it's striking how, so many millennia apart, we can employ a visual language that is not identical but certainly similar. 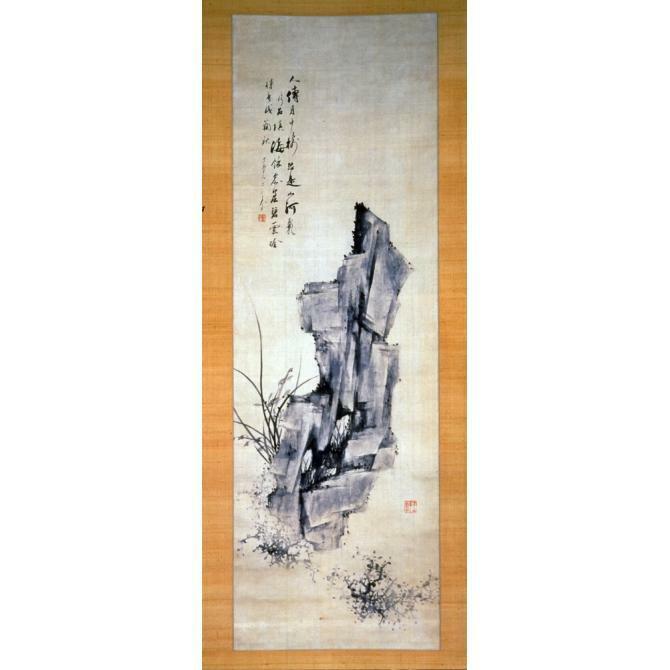 Garden rocks in unusual shapes were favored among scholars as a subject for painting, but the work shown here is unlike traditional depictions of eroded rocks. Instead of rendering a realistic depiction, Jeong built up the entire rock form using a series of interconnected vertical and horizontal cubes juxtaposed with each other. He also sprinkled the contours with two-tailed dots. To balance the structural and cubic nature of the rock, he painted gentle orchid leaves and flowers behind the rock as well as thorn bushes in soft washes on the ground. Then, a few weeks ago, I unexpectedly wandered into the exhibit "Repentant Monk: Illusion and Disillusion in the Art of Chen Hongshou," at the Berkeley Art Museum. Imagine my surprise when I saw the cubist technique again, only this time used much earlier. I couldn't help but wonder whether the Korean painter had studied Chinese landscape painting and was inspired by the work of Chen Hongshou (1599-1652). Before I was warned that no photos were allowed, I took this one, where cubist rocks are visible in the right-hand panel. "Old Tree, Banana, , Bamboo, and Rocks." Leaf A. Album of Birds, Flowers, and Landscapes , 1630-32, by Chen Hongshu. Berkeley Art Museum, Berkeley, CA. It strikes me as more than interesting that what Western artists thought was completely innovative had actually appeared in some form before, including long, long before. One last example, though there are dozens more. In the spring of 2014, I visited the Museum of Fine Arts in Boston. "Quilts and Color: The Pilgrim/Roy Collection" was an eye-opening exhibit. Quilts, including from the 1800s, plainly appeared as the progenitors of 20th-century abstract art. Aware of the strong likeness between the two distinct forms of creative expression, the curators juxtaposed works by British artist Bridget Riley (1931-), American artist Sol LeWitt (1928-2007), Hungarian-French artist Victor Vasarely (1908-1997), and others. Considered a "grandfather" and leader of the op art movement, Vasarely created work that resembles the traditional pattern of "tumbling blocks." Could he have seen an Amish quilt in Europe? Who knows where his ideas for optical illusion came from? Detail of Amish "Tumbling Blocks" quilt, Ohio or Indiana, 1920s. "Quilts and Color: The Pilgrim/Roy Collection," Museum of Fine Arts, Boston, 2014. Amish "Tumbling Blocks" quilt, Ohio or Indiana, 1920s. "Quilts and Color: The Pilgrim/Roy Collection," Museum of Fine Arts, Boston, 2014. Its [Art's] development does not consist of new discoveries which strike out the old truths and label them errors (as is apparent in science). Its development consists of sudden illuminations, like lightning, of explosions, which burst like a fireworks in the heavens, strewing a whole "bouquet" of different shining stars about itself. This illumination shows new perspectives in a blind light, new truths which are basically nothing more than the organic development, the organic growing of earlier wisdom which is not voided by the later....The trunk of the tree does not become superfluous because of a new branch: it makes the branch possible. What similarities have you noticed between the art of a particular period and the art of an earlier time in a different culture? Which artists inspire/influence you in the creation of new work? How do you translate/transform what they did to make something original?